Apologies if this has been covered, haven't seen it anywhere. 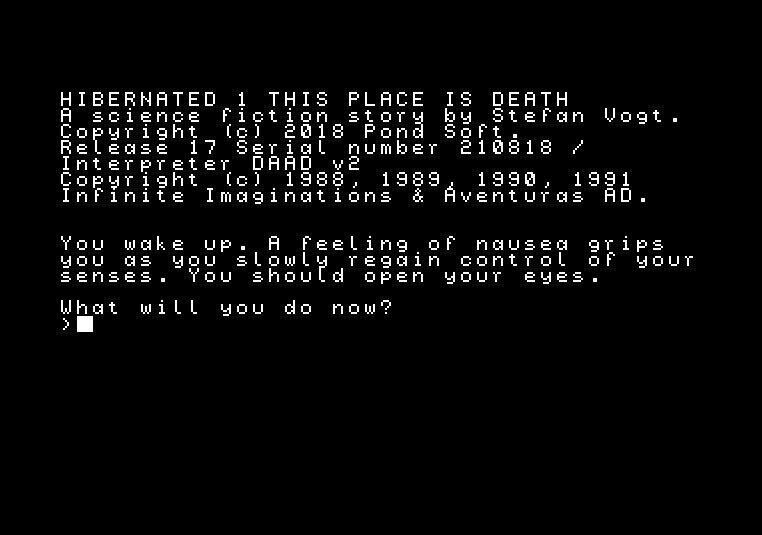 Hibernated 1: This Place is Death is a sci-fi text adventure by Stefan Vogt released for a variety of different platforms along with our beautiful Atari ST. We are Olivia Lund onboard the intergalactic spaceship, Polaris-7, who has awoken from stasis too soon. The ship appears recently abandoned and has been caught by an alien tracker-beam...Text adventures aren't really my cuppa tea but I've enjoyed myself today if I'm honest. I often soon bore and struggle to get anywhere but the parser is easy to use with its two-word command system for Examine, Get, Open, Search, Move, etc. There are also shortcuts: I for Inventory and R to redescribe the current location. Medium resolution is supported but oddly not monochrome... The docs advised making a map and that is a very good idea! !Hibernated 1 is possibly the first of a new trilogy which can be downloaded and bought right now. Name your own price - which I think that is a wonderful idea - thus play before you pay. Any text-adventurers lurking out there? Thanks! Didn't hear about it before, will check it out! The scenario is promising. I hope the parsing is as good as Doomsday Lost Echoes! Played it for one hour, so far it's very good! Finished it (with the help of the solution two or three times...). It's pretty good! The puzzles are logical, though the input of the analyzer is at times limited, so it is sometimes hard to know what to do or what are the consequences of an action. A good game nonetheless! Yes... you have to get used to it. Something you always should to avoid when writing an adventure is to mention things in the text that later cannot be referred by the player in the same way you mentioned them. It is quite frustrating but, traditionally, it was accepted as necessary in 8 bit games due to the limited RAM availability. There are workarounds for this, though, but this game behaves as the old school ones in that regard . Not sure what version of the game people have played above but it's worth noting that Hibernated 1 originally started out as a Quilled C64 adventure before being ported to PAWS using inPAWS on Spectrum / Amstrad CP/M / PC DOS etc. 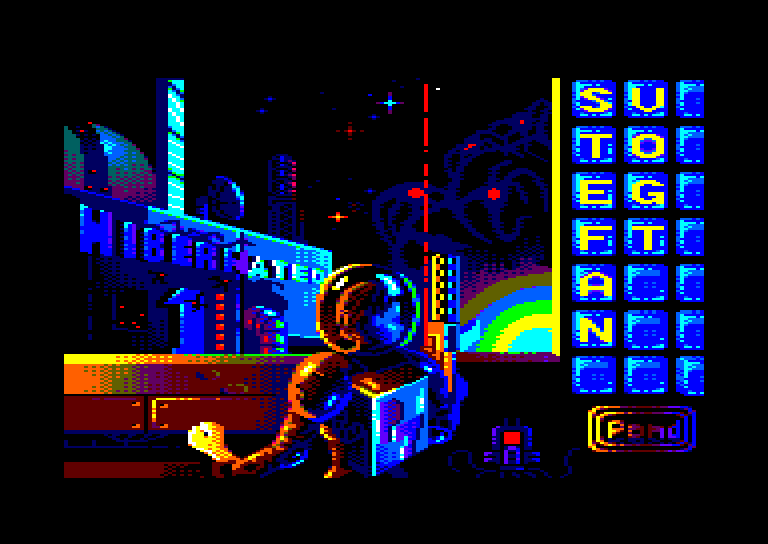 Stefan, the author, has recently remade the game using the DAAD writing system and now the Amstrad version is available for tape-based machines. All the latest downloads of Hibernated 1 are here https://8bitgames.itch.io/hibernated1 and the game itself will be getting a physical release (with a bonus adventure) soon. The Amstrad release will be on tape, I believe. DAAD itself should be of interest to Amstrad text adventure gamers. Originally written for Spanish adventure company Aventuras AD, it's recently been reocvered & re-released by Stefan Vogt and Tim Gilberts. The new version includes full support for English-language adventures and allows you to produce a game, from a single source, that can be published on C64, Spectrum, CPC, MSX, PCW, ST, Amiga and DOS. See... http://8-bit.info/infinite-imaginations-aventuras-ad/ for more information and to download the system. Not out yet. Stefan says preorders will be up soon via Polyplay. Ohh time to get a new jacket then! Just some short facts regarding the physical releases which can now be preordered from Poly.Play. We are not bringing one CPC version, we are bringing three. You can choose between a 3" disk version, a 3.5" disk version and a tape version. There is no real difference regarding the contents of the 3" and 3.5" version. Both come with the native CPC version and a CP/M based 80-columns version in addition. The tape version is a "flippy" like you probably remember from the Mastertronic releases, one side is CPC the other side is Spectrum. The tape only comes with the native version. The most important news is that ALL who order the physical release get access to "Eight Feet Under", which is a standalone addon to Hibernated 1. It's a full featured adventure that narrates a previously unknown part of the Hibernated 1 events and with a pretty unexpected protagonist. Both Hibernated and EFU come with amazing artworks by Dylan Barry aka rail_slave. Here are some images, the EFU loading screen should be new to you guys. I just found out about that, it's super cool! Will preorder! - You say the regular CPC version won't work with French computers. Were you able to look into the issue? - Does the micro SD include images of the game+addon for other machines too? With so many options it's hard to choose one. - Will you only have collector's editions made? A "budget" cassette release for the Spectrum/Amstrad would be interesting. - I'm a tiny bit sad that you didn't include colours for the IBM versions. It was probably too time consuming to do variations for CGA, EGA, VGA and TGA. I would have loved to have colour graphics on my Tandy though. - It actually depends on what model you have. Many French CPCs work very well. It's just the late models with AZERTY keyboard that won't work. If you have a QWERTY keyboard on your CPC it will definitely have no issues. But the whole matter is not a typical Hibernated problem. The late AZERTY models had many, many compatibility issues, especially with adventures that make use of the keyboard because of the modified keymap. I still have no idea what Amstrad was thinking back then. There are probably workarounds I'm not aware of. The keymap is hardcoded in the interpreter, so to resolve the issue, the whole interpreter would need to be recoded to support the AZERTY layout. The game uses DAAD, an engine created by Tim Gilberts of Gilsoft / Infinite Imaginations. I addressed the issue and already talked with Tim (I know him very well), but I'm not very confident to get AZERTY support added soon. The 80 columns version works without any issues on any French model, so for now this is the only workaround unfortunately. - The SD card includes all images of Hibernated for all systems. The addon is just included as a download code in the box. Eight Feet Under is bigger than Hibernated, adding physical media for the addon too would have gone beyond the budget. It's just 20 Euros for a big box with feelies, e.g. a patch, a poster, lots of content, that's quite value for money and we wanted to keep it that low. You can download all images for the addon though as well. The publisher now added an all-in-one bundle if it's the physical media you're after. - For now, there will be only big box releases. The publisher did budget versions in the past, so maybe it's going to happen one day but I can't promise that. The Amstrad "tape" version kinda is budget already. Because when you order this version, you get the Spectrum version on the other side of the tape. - The engine actually supports EGA/CGA/VGA. It's just that the artist who created the title picture (Vanja) chose a black and white style screen for Amiga / ST / and IBM (DOS). My physical edition of Hibernated 1 arrived today! It's stunning. Comes with a manual, memory card, mission patch, poster, stickers and more. Oh... And you get the excellent two part bonus adventure Eight Feet Under too! My copy is the ZX Spectrum/Amstrad CPC edition but there are plenty of flavours for fans of other 8-bit and 16-bit games too... See https://www.polyplay.xyz/navi.php?qs=hibernated for details. Page created in 0.147 seconds with 70 queries.